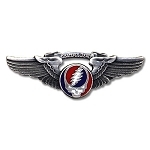 This button features the Shakedown Street album cover design. Approx. size is 1.5" square. Officially licensed Grateful Dead merchandise.